Manhattan Associates is a best-in-class global solutions provider for supply chain leaders. They make commerce-ready supply chains that bring all points of commerce together so companies are ready to sell and execute. Across the store, through your network, or from your fulfillment center, Manhattan Associates designs, builds, and delivers market-leading solutions that support both top-line growth and bottom-line profitability. By converging front-end sales with back-end supply chain execution, their software, platform technology, and unmatched experience help customers get commerce ready—and ready to reap the rewards of the omni-channel marketplace. Learn more at: manh.com. As a global organization, Manhattan Associates needed to provide exposure to Distribution Center operations to employees. Often, employees who work on code for their software solutions may have little exposure to the operational components, needs, and processes of a distribution center. Manhattan Associates' employees who have the opportunity to participate in on-site visits of Distribution Centers often experience "ah-ha" moments when stepping inside the warehouse. Suddenly, databases full of item codes and numeric quantities become real products on real shelves moving to and from. Unfortunately, not all employees are able to participate in on-site visits. This e-learning course provides learners with a tour of the Distribution Center, introduction to the people/roles who work at a Distribution Center and recognition for what motivates each. To truly provide innovative solutions to address challenges in a Distribution Center, developers, consultants and analysts alike must apply their software application skills in the context of the real life environment—the Distribution Center. For Manhattan Associates, this e-learning provides the opportunity to take a tour, virtually, of a typical Distribution Center. In this course, learners not only "tour" a Distribution Center, they “try out” the activities performed, and experience first-hand the challenges to manual processes and benefits that the software-enabled optimization provides. Through their tour, learners meet the people who work in the Distribution Center and experience how they are motivated. To accomplish this, a series of mini e-learning events build around each stop on the tour. 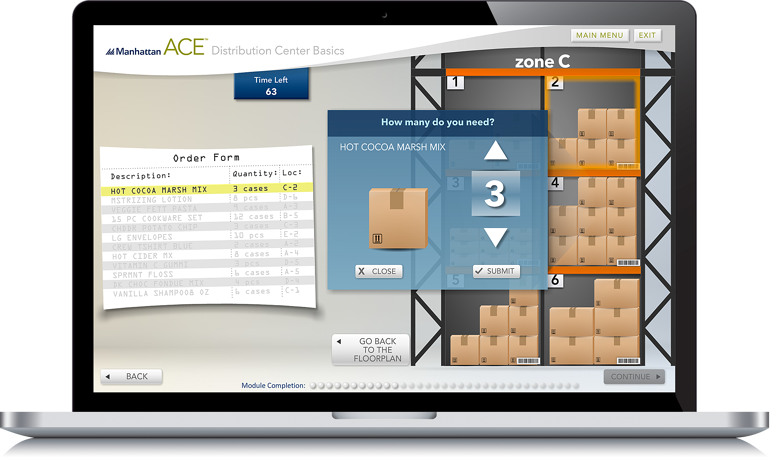 A virtual Distribution Center allows learners to employ context to their projects. Recognizing the role the Distribution Center plays in the supply chain provides learners with an understanding of how their work helps the success of the business and the success of Manhattan Associates' clients.